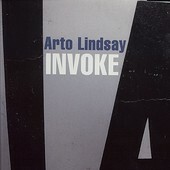 Former DNA and Ambitious Lovers' member Arto Lindsay's latest solo record, Invoke further explores his love of Brazilian pop music (Lindsay is a Brazilian native), while also playing up his love of avant-garde. A mood record of extraordinary proportions, the softer demeanor ensures the record isn't your first pick for a party, however the bright production and more upbeat presentation of the disc help it stray away from late-night discussions. Somewhere between the two lives Lindsay's experimental explorations, as he examines and dissects culture and counter culture and builds upon it to craft his commercially non-commercial results. I'll give it a B.